A gentle facial liquid soap thoroughly removes surplus lipids, dead skin cells, and make-up remainder while maintaining the natural acidity and moisture of the skin. 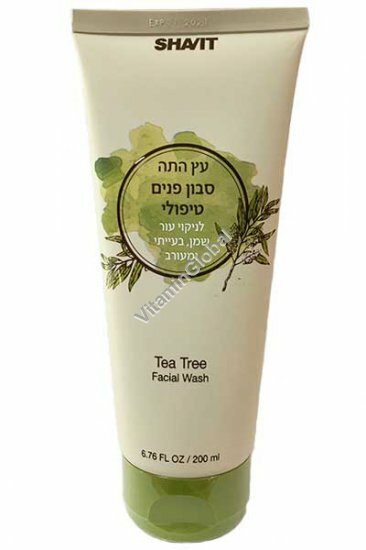 Contains Tea Tree extract and enriched with Lavender oil, Sage, Chamomile, and Calendula. Nourishes the skin during a wash and prevents irritation and dryness. Ingredients: Water, Sodium Coceth Sulfate, Cocamide DEA, Cocamidopropyl Betaine, Sodium Chloride, Glycerin, Phenoxyethanol & Caprylyl Glycol, Fragrance & Linalool & Limonene, Camellia Sinensis Leaf Water, Citric Acid, Tea Tree Leaf Extract, Caprylyl Glycol, Chlorphenesin, Witch Hazel Leaf Water, Calendula Extract, Tetrasodium EDTA, Sage Leaf Extract, Lavender Oil. How to use: Use facial wash mornings and evenings. With tepid water, dispense a small amount into the palm of your hand and massage gently into the skin. Rinse thoroughly with water. Suitable for daily use.